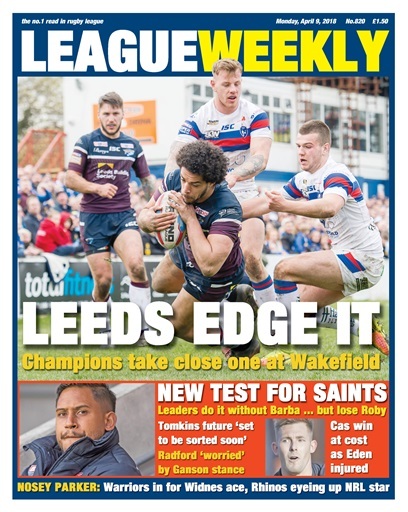 We've got all the action covered as Leeds edge it at Wakefield while Cas hold off a Giants revival – but at the cost of an injury to one of their biggest weapons. 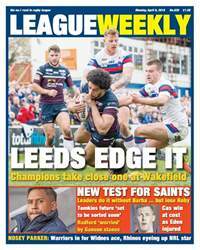 Saints pass one test with flying colours but have another on the horizon... find out why Chris Chester reckons Trinity can turn them over. We have the latest on Sam Tomkins's potential move to Catalans while Matty Smith addresses his St Helens future and Salford edge closer to a new signing. Dave 'Nosey' Parker brings all the latest transfer gossip – including potential signings for Wigan and Leeds. There's a new boost for the New York club's bid to join the RFL league set-up while New Zealand turn to an Aussie for their mid-year test against England in Denver... we reveal which names are in the running. Dave Hadfield reports on the 'war' in France, while Andrew Voss sees things get a little too personal Down Under between Nathan Brown and Wayne Bennett.